Keeping litter dry is a significant challenge in broiler houses. For every pound of feed a broiler eats it will drink roughly one quart of water, 80% of which will end up in the litter and the air in the house. During the first week of a flock the birds in a typical 40' X 500' broiler house (23,500) will consume roughly 7,800 lbs of feed and drink 1,675 gallons of water. By the third week of the flock the total amount of water consumed increases to approximately11,800 gallons. By the end of the flock (56 days), the birds would have consumed 87,000 gallons of water. To put this in perspective, if a producer didn’t remove any of this water, there would be nearly six inches of standing water in the house at the end of a flock. Excessive moisture in a poultry house will inevitably lead to wet litter and increased ammonia generation. Wet/damp litter will increase the incidences of pododermititis which in turn can lead to leg problems, both of which can prove costly to a grower High ammonia levels will lead to reduced weight gains, increased feed conversions, and increased susceptibility to disease. Excessive moisture in a poultry house will also lead to condensation forming on fans, air inlets and other equipment which in the presence of high ammonia concentrations can lead to corrosion of metal components and reduced equipment life (Poultry Housing Tips. Vol. 26 no. 9). To prevent the buildup of moisture in the litter, producers must constantly exchange the moist inside air in a poultry house with the relatively dry outside air. If a producer can remove the same amount of moisture from their houses each day that the birds are adding, they can maintain a constant moisture level in their houses and problems associated with excessive moisture will be minimized. Determining how much a house needs to be ventilated to remove the water the birds are adding each day requires the use of a psychometric chart. A psychometric chart enables the user to determine exactly how much moisture there is in each cubic foot of air at a given temperature and relative humidity. If the amount of moisture in each cubic foot of air for both inside and outside a house is known, the number of cubic feet of air required to be exchanged to remove a specified amount of water from a house can be calculated. 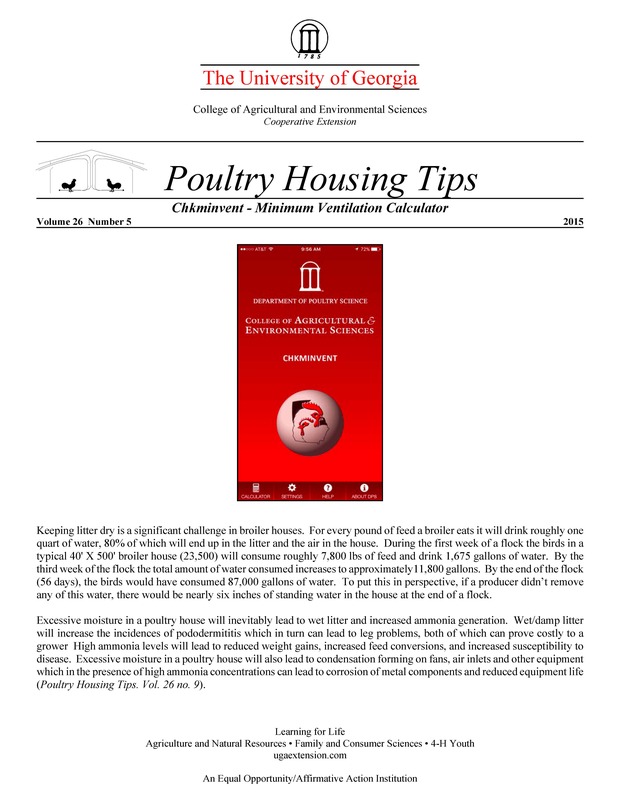 The challenge is that few poultry producers know how to use a psychometric chart, or are familiar with the formulas required to convert the numbers taken from a psychometric chart into a usable moisture removal ventilation rate. From this the App will calculate a moisture balance ventilation rate as well as a minimum ventilation fans runtime (% runtime as well as seconds on/off out of 300). Using the Chkminvent app is quick and simple. For example, let’s say a producer wanted to determine how long he needed to operate his two 36" fans (10,000 cfm) when it is 40oF outside and raining, the birds are drinking 1,000 gallons of water, and the inside temperature is 80oF. For inside humidity is generally best to input the desired relative humidity instead of the actual humidity. For instance, if the relative humidity in a house is 80% and that is the inside relative humidity value used in the app, the app will calculate the minimum ventilation rate required to maintain a relative humidity of 80%...which is too high. When using the app it is generally recommended to use an inside relative humidity of 50%, which is typically considered the ideal relative humidity. For moisture to be removed it is important to remember that we don’t necessarily need to get rid of all the moisture birds are drinking because roughly 20% of the water will be retained by the bird. As a result, though the birds are drinking 1,000 gallons of water a day, in this example the producer would input 800 gallons for the moisture to be removed. From this information the app calculates a minimum ventilation rate of 10,782 cfm or a runtime of 162 seconds off/138 seconds on (52%) for the two 36" fans. How would the moisture balance ventilation rate change if it were 60oF outside and the relative humidity were 60%? Touch the back arrow in the upper right corner of the screen, change the outside conditions, touch “calculate” and you will find that the moisture balance ventilation rate would need to be increased to approximately 14,000 cfm and the interval timer setting would need to be increased to 212 seconds on/88 seconds off. 1) Calculated moisture balance ventilation rates provided by the app are only an estimate and provide a point from which to start. The relative humidity of the air in a house should be monitored and recorded daily. Regardless of the minimum ventilation rate determined by the app, if humidity levels are increasing, then minimum ventilation rates should be increased. 2) The Chkminvent app calculates a moisture balance ventilation rate, that is a ventilation rate that will in a sense maintain the status quo. If the litter is wet and you want to remove this moisture in addition to what the birds are adding, the calculated minimum ventilation rate needs to be higher than what is calculated by the app. 3) The minimum ventilation rate required to control carbon dioxide, carbon monoxide and ammonia may be higher than that determined by the Chkminvent app. As with house moisture levels, the best way to determine if you are ventilating enough to control these air quality variables is to measure them on a periodic basis. 4) The calculator assumes that all the air entering the house is entering through air inlets and is warmed to near room temperature before moving down to bird level. As air is warmed the relative humidity of the air decreases, making it possible to maximize the amount of moisture removed from the air and litter in the house by each cubic foot of air brought into the house. If a significant portion of the fresh air enters through cracks and not air inlets the amount of moisture removed from the house will be reduced. The cold air entering through cracks may not be properly warmed and dried before moving down to floor level (Figure 8) and therefore the leakage air will remove less moisture from the house compared to the air entering through the air inlets. As a result, the moisture removal ventilation rate calculated by the Chkminvent app will tend to be lower than that actually required to remove the specified amount of moisture. 5) It is possible to input conditions that are not realistic, namely those where the moisture-holding capacity of the inside air is less than the outside air, into the Chkminvent app. If this is done the message “Outside air moisture content cannot be greater than inside air moisture content” will appear. It is important to realize that in the vast majority of situations the air inside the house will be have more moisture in it than the air outside for the simple fact that the air inside the house came from outside the house and the birds are adding a significant amount of moisture to it, thereby raising the amount of the moisture in the inside air over the outside air. Don’t confuse the moisture content with relative humidity. The fact is the relative humidity of the outside air can be higher than that of the inside air and still have a lower moisture content. Relative humidity is an indicator of how “full” the air is with moisture relative to temperature. A cubic foot of cold air cannot hold as much moisture relative to warm air and therefore even if the relative humidity is 100% there may not be much moisture in the air. For instance, if it is 40oF and rainy outside (100% Rh) there will be 0.046 gallons of water in every 1,000 cubic feet of air. If inside it is 80oF and 50% Rh there will be 0.117 gallons of water in every 1,000 cubic feet of air. The fact is that 80oF air can hold four times the amount of moisture than 40oF air, so even though the inside air is half full of water (Rh=50%) there is much more water in the air (2.5 times) than there is in the cold outside air (Poultry Housing Tips Vol. 21 no. 13). 6) If the calculated ventilation rate is greater than the air moving capacity of the minimum ventilation fans inputted, the error message “The Moisture Control Ventilation Rate (XXXX) cannot be greater than the Minimum Ventilation Fan(s) Capacity” will be appear. If you see this message increase the number of fans you are planning to use for minimum ventilation. For example, if you entered 20,000 cfm (two 36" fans), increase it to possibly 30,000 cfm (three 36" fans) and recalculate. 7) The air moving capacity of minimum ventilation fans is often lower than commonly assumed. Most 36" minimum ventilation fans move closer to 8,000 cfm than 10,000 cfm. Likewise, most 48" fans move closer to 18,000 cfm than the 20,000. Overestimating the air moving capacity of minimum ventilation fans can easily result in calculated moisture removal ventilation rates being 20 to 30% lower than what is actually required. 8) “Inside Temperature must be at least 5oF greater than Outside Temperature.” The Chkminvent app is intended for use during cold weather when moisture control is of primary concern. When the temperature difference is less than 5oF (ie. 80oF inside/75oF outside), in most cases a house’s exhaust fans will be operating to remove excess bird heat from the house and the fans will not be operating in a minimum ventilation mode. The Chkminvent app is available from the Apple App Store. There are plans for making an Andriod version of the app available sometime in the future.